Leader of Turkish opposition compares use of tear gas by police on demonstrators to Nazi gas chambers. Leader of the Turkish Opposition Nationalist Movement Party (MHP) compared the use of tear gas by police on demonstrators in countrywide protests to Nazi gas chambers, Turkish newspaper Hurriyet Daily News reported. “Yes it is true that the [ruling Justice and Development Party] AKP has established gas chambers similar to the Nazis, it is true that the AKP pokes its nose into everybody’s private lives,” said MHP leader Devlet Bahçeli during a meeting in Parliament. “But the only place to overcome the AKP is the elections, those who are irritated by the prime minister’s authoritarian tune should not leave the path of legality. Whatever happens, the solution is democracy,” he said. Bahçeli went on to call Prime Minister Recep Tayyip Erdogan “vindictive and arrogant,” according to Hurriyet Daily News. Prime Minister Erdogan has been facing some of the fiercest protests in his decade-long rule. The demonstrations began as a protest against turnign a green area in the city into a development. 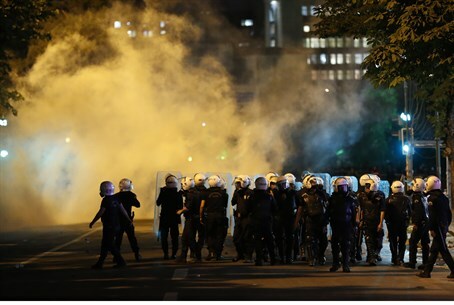 The unrest, which began on Friday after police cracked down on a demonstration in Istanbul, quickly blew up into anti-government protests across the country. Tens of thousands of people took to the streets Sunday in Turkey's four biggest cities and clashed with riot police on the third day of anti-government demonstrations. Hundreds began streaming into Istanbul's Taksim Square Monday morning, too, despite more than 1,000 arrests already carried out across the country.